You can’t go wrong when buying the CND UV Lamp ! It is made by one of the best nail polish manufacturers in the industry and will work with any type of gel nail polish. This lamp is a sturdy and reliable machine that is really easy to use and is definitely professional quality. It comes with 4 9W lightbulbs that have a lifespan of 100 hours. You need to replace all bulbs at the same time after you use them for 100 hours. The bulbs can be bought online and a 4-pack is only $34 so it’s very cheap to maintain this lamp. Where to Buy a CND UV Lamp? 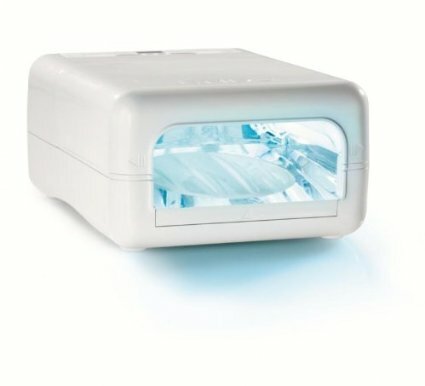 -Before using your new CND UV Lamp, you need to remove the top of the lamp to make sure you take off all of the blue protective film. The lamp comes with 4 preset timer options A-D. A = 10 seconds, B = 1min, C = 2 mins, D= 3 mins. Press the button corresponding to the time you want to cure your nails. The timer will count down to zero and the bulbs will shut off automatically. Lets say you want the minimum time to be 30 seconds instead of 10 seconds. You can program a custom time by changing one of these preset times. Press and hold the button you want to change the time of (example hold down A to change it from 10 secs to 30secs). Hold the button down until you hear 3 beeps sound and the time value flashes. Then press + or – to reach your desired time setting. Checkout the full CND UV Lamp Manual if you have questions on operating or taking care of your lamp. Thank You! Come back often…I have lots of new post ideas that I am working on.